Damn, that’s a pretty sweet ride you got there. I am LOVING this comic so far. It reminds me of Tim Burton, if you don’t mind me saying so. I can’t wait to see what happens next! This looks like it’s going to be a really great webcomic, I can’t wait to see what Happens next! Thank you! I hope I don’t disappoint! 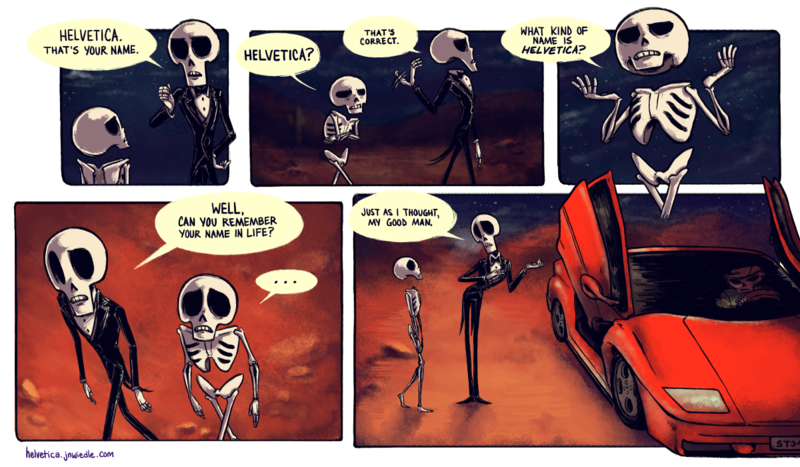 don’t be mad little skeleton dude, helvetica is a pretty sweet name! i can’t get over how good you are at drawing poses and expressions. i’m so jealous! Nice style so far. How much of a “Grim Fandango” influence do you have going here ranked from ‘What kinda name is Grim Fandango’ to ‘Wait till you see ‘Glottis’ show up later in his sweet dragster? I’m rereading this webcomic because it’s a wonderful thing, and I’m sort of jealous that I’m not as skilled as you. Undertale brought me here, but thoroughly enjoying this comic made me stay. I honestly feel like this comic should be a movie or tv series. Huh. So this came out AFTER Undertale, even though the font-skeleton’s name dynamic is the same. Interesting. Before Undertale, actually. Toby Fox got the font-name idea from this webcomic.